Our Design Studio is a team of industrial designers, interaction designers, app developers, mechanical engineers and prototype specialists who are truly integrated under one roof with the rest of our wireless product development engineers. We believe it takes an integrated, diverse team to efficiently and successfully bring the right product to market. The Design Studio is experienced at creating value for the end user while balancing the business and technical requirements of all stakeholders. Our team will partner with yours for the full spectrum of product design, from research through production. With every project we take on, the end-user's interaction with technology is at the center. Many product design firms lack access to or knowledge of the complex technology that exists in today's connected products. By working directly alongside RF and antenna engineers, we can truly integrate wireless connectivity into the product and maximize its performance, while balancing human centered needs. Our customers benefit from our integrated structure and collaborative approach because they don’t have to manage the communication and time spent between the creative and the engineering teams. The bottom line is we offer turnkey product design and development so you can get to market faster with an innovative wireless product that your customers will connect to both physically and emotionally. "LSR's Design Studio team excels at building strong collaboration with their clients. This trust creates a truly 'open environment' for design, amplifying the creativity and innovation within their clients' R&D programs." Setting an effective Product Strategy can be difficult. Both technology and consumer preferences are complex and constantly evolving. Design research doesn't have to be verbose and expensive when conducted by a partner helping uncover insights for your most critical questions. We can help your teams tap into your customer demographic and product experience to discover unmet needs and innovate. The voice of the customer helps drives innovation so your products become more relevant and more valuable to your audience. The insights we get from contextual interviews and ethnographic studies create a solid foundation for the rest of the product development process. Our researchers will help better understand your future customers, identify problems to solve and innovation opportunities in the market. We don’t believe in heavy report papers that no one will read. Instead we document clear and actionable insight in a compelling and visual presentation that the designers and engineers can really benefit from throughout product development. There's never just one solution to a problem. The more ideas that can be brought to the table the better chance you are going to identify a solution that is valued by the end-user. Good design process always includes this divergent thinking exploration phase. We lead structured exploration sessions to generate hundreds of ideas. From there the design team can explore these further by developing sketches, use case storyboards, renderings, and mockups so that ideas can be better communicated and understood. Generating ideas is often the easy part. Culling these down and combining them to get the right product concept can be more difficult. This is where organized convergent design selection processes can help. We lead collaborative workshops where ideas can be organized and vetted through healthy debate and evaluation of mockups. Knowing the end goal is to produce a product that has real value to the end user, we take product concepts out to real end users to hear and understand their reaction. Finally we bring all stakeholders together, including our technical engineers, to evaluate and select the best candidates. In the end, we deliver conceptual designs that have been thoroughly evaluated and offer the best chance of success. and least chance of an unexpected "gotcha." Our top-notch creative team manages innovation at the front end of Product Design and Development, as well as the details at the back end. We are equipped with access to the latest technology and prototyping techniques. We have very few walls and have banned cubicles. This space is a place where teams gather with clients to innovate. The result is a team that collaborates as a true extension of our clients' project team, discovering and developing innovative opportunities. Our industrial designers have designed in just about any market you can imagine, designing everything from medical devices to wearable tech. They are experienced at driving for innovation, creating value, managing visual brand language and emotionally connecting with the end user through excellent user experience and appealing physical forms. These artists have learned to innovate while maintaining a focus on business objectives, ensuring manufacturability and cost goals are integral aspects of the design strategy. As designers we care about user experience, creating innovation, and getting the product to market. We are different because we value brand experience and we understand the technology inside. We work as a team with our engineers and software developers from day one. Think about us as a design firm within a technology firm. We make sure the big picture strategy is right and that the details are minded. 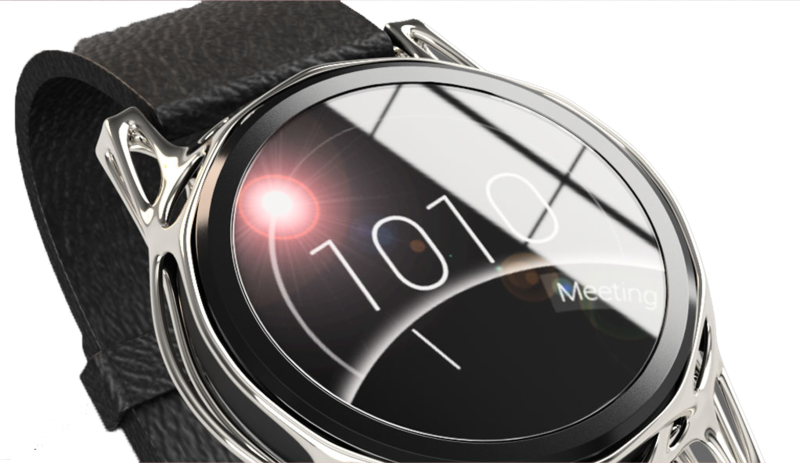 This smart watch concept explores the possibility of employing multiple screens placed at different angles to separate content that may be more discretely viewed with just a glance. This fashion bracelet screens calls, texts and alerts through discretely vibrations, so the phone can stay in her handbag or clutch. We developed the design, hardware and software all the way through to production hand-off. Shown here is a early visual model used for crowd funding. 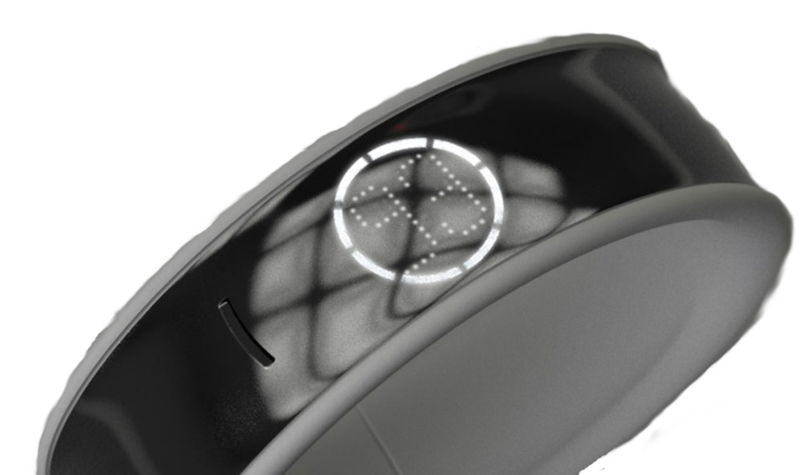 We built multiple functioning prototypes while working closely with our in-house antenna experts to build a unique, high-performance antenna that was integrated into the metal exterior of the bracelet. Here is a design concept for a blood glucose meter bracelet, inspired by the fitness band market. We create designs for companies of all sizes. 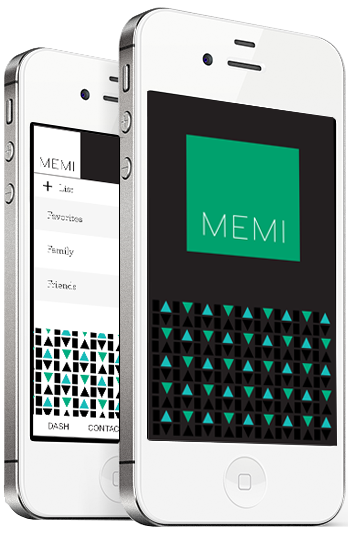 Here is an example of a startup company who we helped refine their fashion technology product. We realize design is more than form & function. Its about durability and manufacturability, too. We also design a lot of wearables for the head. 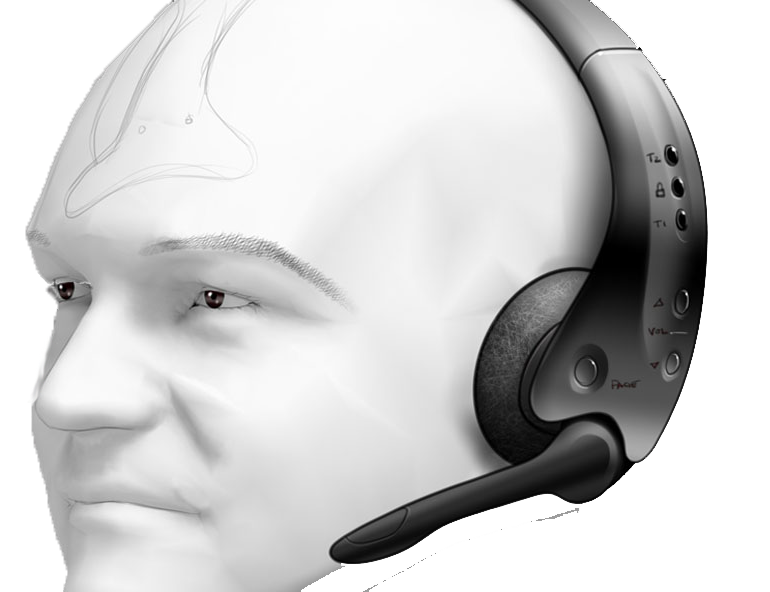 Here is an early concept drawing for a headset designed for the quick serve restaurant environment. 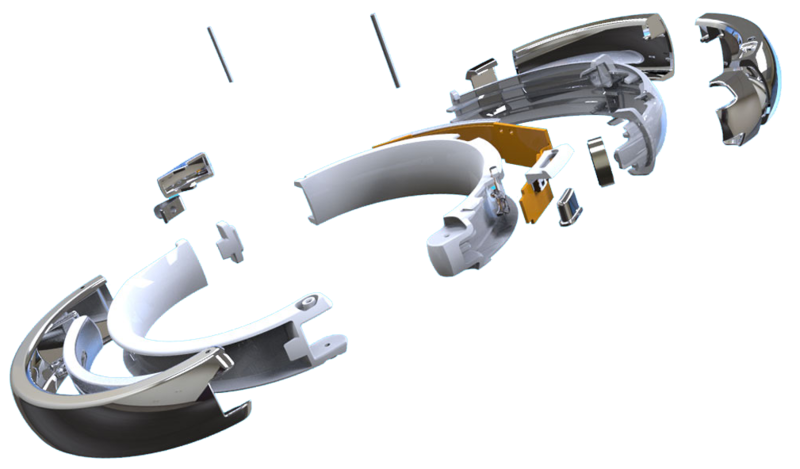 We collaborated closely with our hardware engineers to optimize form, fit, function, durability, and manufacturability. Our mechanical engineers are experienced at preparing designs for production. Our collaborative team helps identify appropriate and innovative manufacturing and material choices that drive product performance and minimizing BOM costs. In addition, the development of complex 3D CAD models and databases ensure your design is properly analyzed, prototyped and produced. Prototyping is a critical part of the product development process. By identifying what works and what doesn’t early we reduce risk and the chance of making costly mistakes. Our diverse, state-of-the-art prototype lab can build everything from a showroom ready visual model to hundreds of fully functional production representative prototypes. We offer various processes of in-house prototyping from rapid and CNC prototyping to plastic and metal casting. Our clients benefit from the labs close integration with the designers and engineers and the speed at which they can get things done. With all the buzz and rapid growth in the rapid prototyping industry it is easy to forget about some tried and true prototyping technologies. We, as product developers, are often asked "did you print that?" or, "where is your 3D printer?" The perception is that any 3D printer is good for any prototype and that prototype materials are as good as production materials. Many of our clients are looking for initial samples or low volume production long before they can commit to hard tooling or a contract manufacturer. This is where our experienced prototyping team becomes valuable. We can make a few parts or hundreds of parts. Because all good product development involves prototyping of many types we stay on top of the latest processes and can help guide or lead the project through the toughest prototyping challenges. We can take it from print to showroom ready or test lab ready assemblies. CNC isn’t typically thought of as a rapid prototype but we think of it as a rapid way to get accuracy and quality. We decided to bring this technology in-house because it doesn’t limit us in the materials that printed processes do. Because most of our product designs include internal antennas that our in close proximity or even integrated into the housings, our material options cannot be limited. Custom Mobile App Development is an integral component of the product experience you create for your customer. Too often, though, so much emphasis is placed on the technical development of the wireless product itself that the app’s user interface becomes an afterthought that is addressed too late in the project. Approaching the design of both your product’s wireless solution and the app concurrently will provide a faster development timeline and a memorable total product experience for your user. The term “App” is one simple word that describes an immensely diverse range of user experiences. From simple games and utilities all the way to full-featured applications that provide remote monitoring and control of products and complex systems, it goes without saying that not every app development firm is ideally suited to meet your specific needs. This is where the value of a design studio embedded within our wireless expertise shines through once again. Map the App: What does your app need to do? What else could it do? What should it do? Design: What are the best UI practices for common wireless tasks and pitfalls? Focused on the development of apps that utilize the wireless technologies of today’s smartphone (such as Wi-Fi™, Bluetooth® and more) to stream data to and from connected devices, the our Design Studio’s holistic understanding of a wireless communication technologies ensures an App that delivers both technically and experientially. Our team has established best practices to perform common and complex wireless tasks, such as large data transfers, low power communication, over the air (OTA) firmware updates, managing Bluetooth connectivity throughout different states of the app, and security and authentication of multiple devices. Need to connect to the cloud or a web service? No problem. We will help you define the interface for custom web services and write the software to pass the data to the service’s APIs. Our developers use and stay current with leading-edge technology and are fully prepared to migrate when new operating systems are released. What you will get when you work with us is a fully connected product that you can connect with virtually any time and from anywhere. Developing a successful user interface depends on creating a great user experience. If the user needs an instruction manual, your design has failed. The same basic principles of design apply regardless of the user’s device. The structure, look and feel, and interaction all contribute to the interfaces usability, quality, and fit with a companies’ brand. Our interface design team works closely with our app developers on iOS, Android or Web based or embedded hardware applications to create a consistent and quality user experience regardless of hardware platform. Many of our projects require visualizing complex data in a meaningful way. We understand that people are visual thinkers and that there are many ways to make information meaningful. 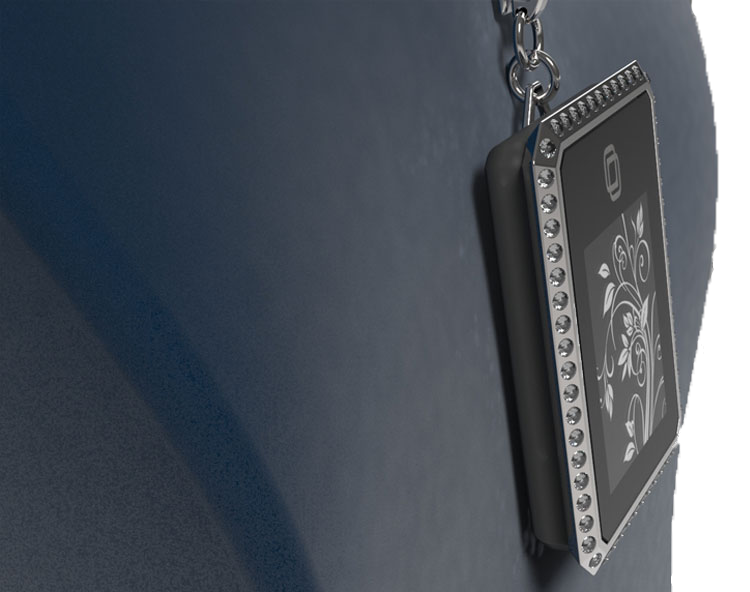 Many of the products we design are loaded with sensors and are connected to the internet. We've designed dashboards for many IoT products that make collecting data meaningful and easy to understand. Creating and interpreting a brand identity for mobile apps is extremely important. User experience can be dramatically affected by the good or bad application of brand. Your brand is built on how customers experience your product. Interfaces are tools to get things done. We understand that even engineering tools need good design. We can design for any hardware or operating system because we understand them at a deep level. Our User Interface Designers understand the technology they are designing around and can make even the most complex systems easy to use and understand.